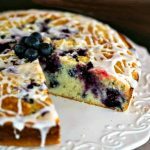 Bursting with fresh blueberries and a dash of lemon flavoring, this lightened-up coffee cake makes a beautiful and delicious brunch dessert. I honestly didn’t intend to post another blueberry recipe so soon, but we’ve been blessed with an abundance of fresh berries from my father-in-law’s 8-foot bushes and I had the itch to do a little baking this weekend. 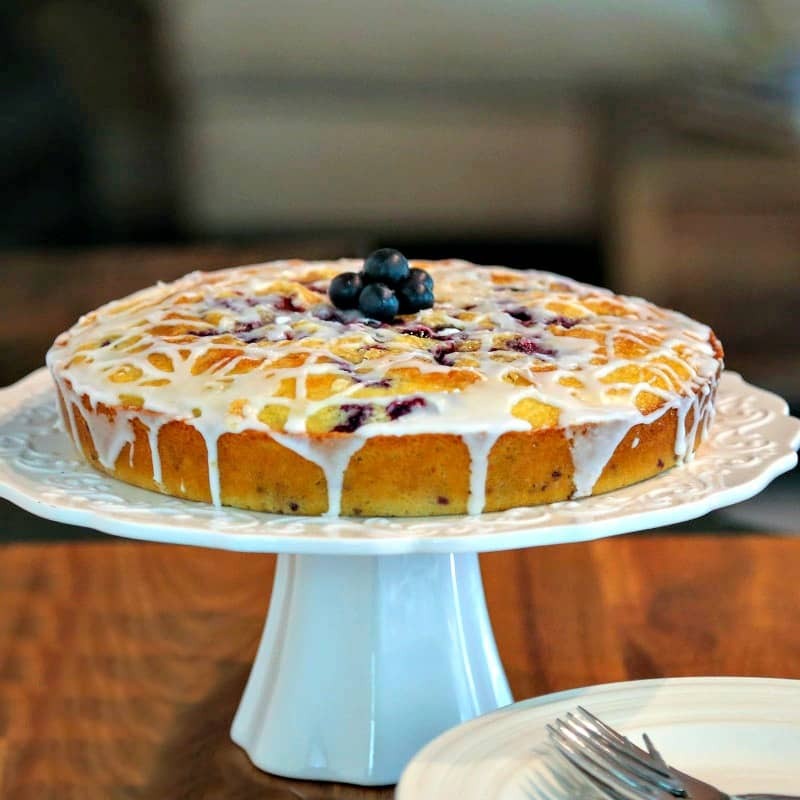 Saturday’s breakfast included this Blueberry Coffee Cake loaded with fresh blueberries and brightened up with a dash of lemon flavoring and a sweet lemon glaze. The last few months I’ve been working diligently to shave off a few pounds and to be more active. John has been super supportive and together we’ve lost more than 40 pounds! We’re both a little trimmer, are feeling better, and are determined to keep up this lifestyle change. Friends have been asking, “What are you doing? !” The answer is simple, really. We’re cutting down on salt, limiting carbs and sugar, and trying to avoid fried foods. Let me tell you, that’s pretty tough for a Southern girl raised on beans and cornbread, gravy and biscuits, and country fried steak! Nevertheless, losing weight and getting a new wardrobe makes up for missing out on these foods every week. I fully intend to splurge once in a while, but I don’t plan on adding these items back into my regular weekly menu. I’ve worked too hard to give in so easily! 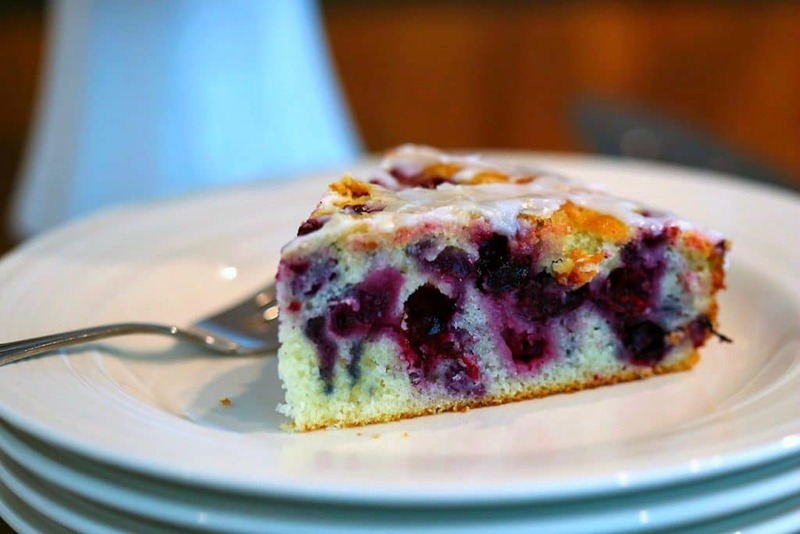 Even so, when I’m longing for something a little sweet, I can feel good about lightened-up desserts like today’s Blueberry Coffee Cake. 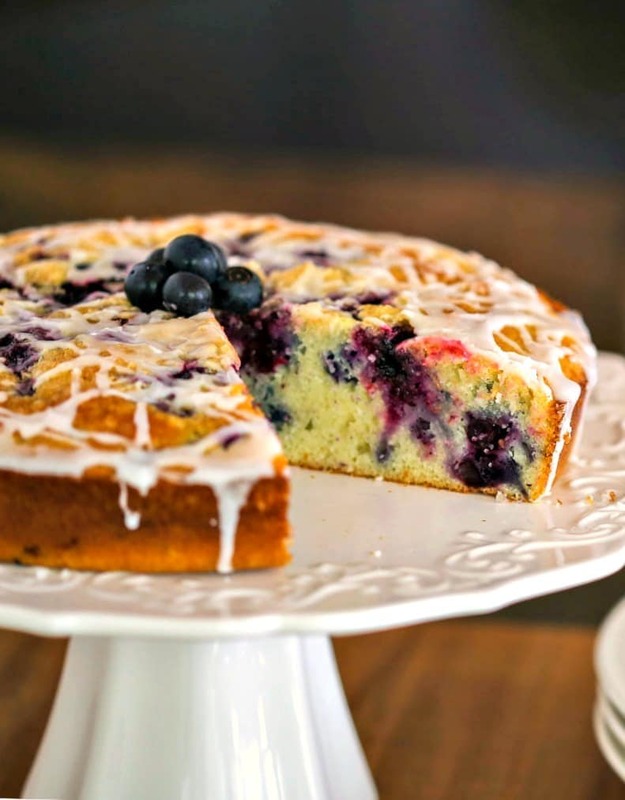 Bursting with fresh blueberries, the batter has less sugar than most other coffee cakes and uses low-fat buttermilk and light butter. The texture isn’t heavy and dense like other coffee cakes, but instead is a little spongy while still being very moist. 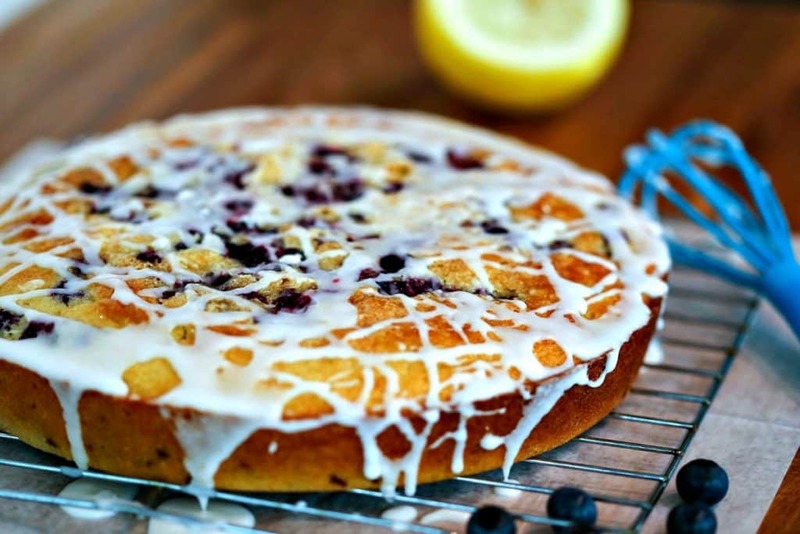 This time, I splurged and added a lemon glaze, but you can certainly leave it off if you want to avoid the extra sugar and calories. Preheat oven to 350 degrees. Lightly coat a 9-inch cake pan with cooking spray. Rinse blueberries and gently pat dry with paper towels. Put into a bowl and gently toss with a tablespoon of flour. Set aside. In a medium sized bowl, whisk together the flour, baking powder, baking soda, and salt. Set aside. In a large mixing bowl, cream together the butter and sugar. Add the eggs and lemon extract and blend until smooth. Alternately add the flour and buttermilk, beginning and ending with the flour, and mix after each addition. Pour half the batter into the prepared pan. 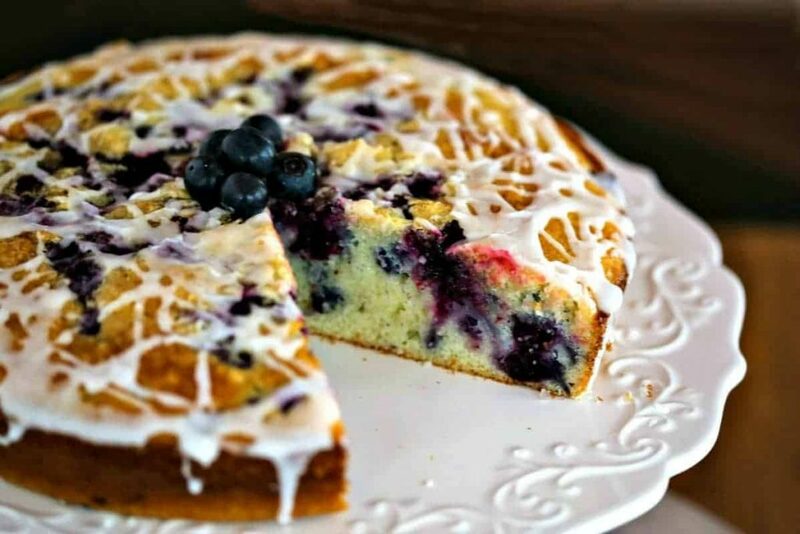 Top with half the blueberries, then add the remaining batter and another layer of blueberries. Sprinkle the turbinado sugar evenly over the top. Bake for 50 minutes or until a pick inserted in the center comes out clean. Let cool in the pan on a wire rack for 10 minutes before removing from the pan. In a small bowl, stir together the powdered sugar and lemon juice until smooth and the desired consistency. Drizzle over top of warm coffee cake. Nutritional Facts are for the cake without the glaze.